On the day after Governor Jerry Brown once again touted his Delta Tunnels Plan ("reliable conveyance") as a "solution" to California's water problems in his State of the State address, Assemblymember Susan Talamantes Eggman (D-Stockton) announced the introduction of legislation to block the Governor’s controversial project unless it is approved by California voters on a statewide ballot. The California voters overwhelmingly defeated a measure to build the earlier version of the project, the Peripheral Canal, in November 1982. Jerry Brown opposes a public vote on the tunnels, as Governor Arnold Schwarzenegger did before him. Eggman said the new bill will require approval via ballot initiative for "any infrastructure project that conveys water directly from a diversion point in the Sacramento River to pumping facilities of the State Water Project or the federal Central Valley Project south of the Delta." “In 2012, the Governor was committed to asking the voters to approve a substantial tax increase. I’m hopeful he will be just as committed to seeking voter approval before embarking on a project that will cost tens of billions of dollars and greatly impact the Delta region,” Eggman said. Senator Lois Wolk (D-Davis), a recognized leader on state water policy issues who has represented the Delta region in the State Legislature for 13 years, joined Eggman in announcing the introduction of the bill. “California’s taxpayers and ratepayers should have the opportunity to weigh in on whether to commit billions of dollars to a project that economists say isn’t a good investment, scientists say is a disaster for the Delta’s ecosystem, and the water exporters’ own studies show will not produce a single drop of new water supply," said Wolk. “The proposed tunnels are the most expensive, most controversial water project proposed in half a century with the potential to permanently destroy the Delta’s ecosystem and community. Californians have the right to look at the facts and decide whether the tunnels are good for California, or whether we should drop this plan once and for all,” she concluded. 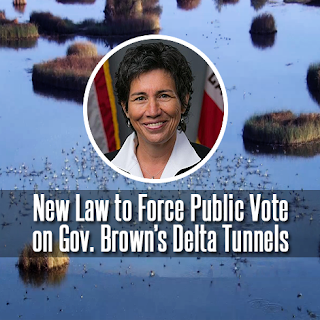 The state and federal water agencies rebranded the Peripheral Canal/Tunnels project as the “California Water Fix” last summer after the Bay Delta Conservation Plan (BDCP) failed to meet environmental standards required to obtain the necessary permits from the federal regulatory agencies. The agencies split the BDCP into two components — the tunnels plan, the California Water Fix, and the habitat “restoration” plan, California Eco Restore. The tunnels project would cost at least $15 billion to $25 billion, according to the administration's estimates, although the real cost of the tunnels could be over $67 billion. The US Environmental Protection Agency (EPA) has given the widely-contested project a failing grade, calling the new environmental impact report “inadequate," according to a news release from Eggman's Office. Assemblymembers Catharine Baker, Susan Bonilla, Jim Cooper, Jim Frazier and Kevin McCarty are joining Eggman and Wolk as co-authors of the legislation. While the Eggman bill focuses just on the Delta Tunnels, there is currently on the November 8 ballot a measure, the "No Blank Checks Initiative," that would force voter approval for public infrastructure bonds amounting to more than $2 billion and requiring new or increased taxes or fees. This initiative, if passed, would effectively force a vote on the tunnels and other similar projects. Dean Cortopassi, a Stockton region farmer and landowner, is spearheading the initiative.